In 1814, a young man rescues a woman during a snowstorm and experiences love at first sight. But she's running from an arranged marriage to an evil man. Can they overcome the danger, or will their fledgling love unravel before it has a chance to take root? 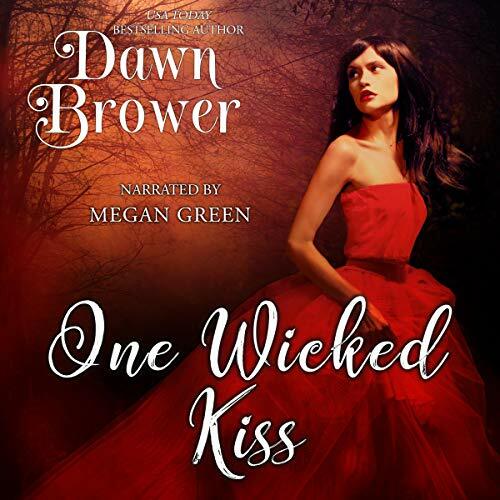 One Wicked Kiss by Dawn Brower is a Regency romance which declares itself from the very first moments to be of my favourite kind, with its series subtitle 'Bluestockings defying Rogues'. 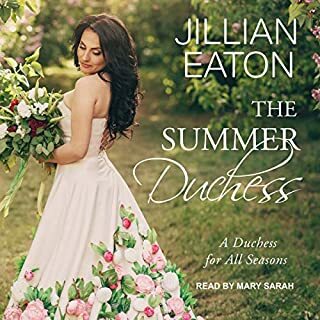 There's little I like more from a historical romance than for a woman - whose intellect and personality are a little too robust for polite society - to get the better of a man who thinks he can best her, so I had high hopes for this audiobook. Miss Natalia Benson, the illegitimate child of Vicount Atherton, is indeed well-educated but seems a little timid compared to most 'bluestocking' heroines, and lacks the feisty wit that defines the type. 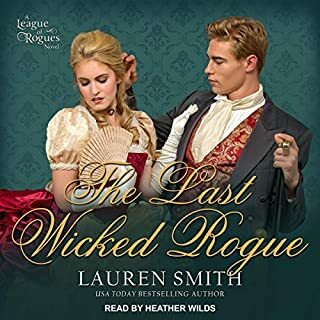 She is not without courage, however, and Lia begins the tale by running away from an unfavourable marriage to a wicked French count. The group she meets on the road stand to change the course of her destiny; and she theirs. As it is merely a brief prequel many of the characters and plotlines are left unresolved, but there's a lot of promise in both the primary and secondary relationships. The set-up for the next book certainly establishes both with enough depth to pique one's curiosity regarding their ultimate fates. It is the start of an adventure, but one which I feel ought to be a free 'teaser' for the series (such as Jodi Taylor's Chronicles of St Mary's prequel, The Very First Damned Thing). 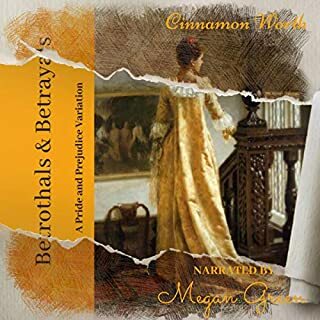 Megan Green's narration is earnest and has a sweet, gentle charm, but is hindered a little in places by a slight lisp and awkward rhythm, which eases as she settles into the story and the language begins to feel more natural. Green delivers the various characters' voices admirably, switching easily from one accent to another without hesitation, despite there being quite an array! It was unfortunate that there was so little subtlety to the protagonists' first meeting. Simply having the Earl think, inexplicably, that "she seemed special" before they had exchanged a word was a rather cheap observation with which to register his interest in the lady. 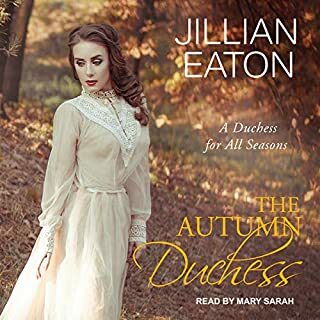 Perhaps because this audiobook is only intended to be a short prequel novella it does not possess the lightness of touch at such a significant moment as would be expected in a novel. It also borrows a few too many well-known names from Austen - Darcy and Western for example - which at times makes it feel a bit like Regency fanfiction. 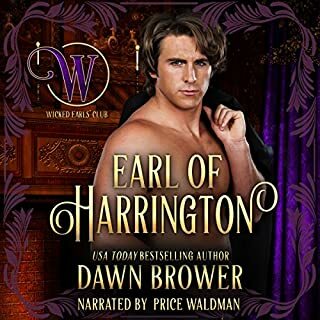 Whilst both surnames are common, I think one will always encounter a little difficulty in trying to establish a unique hero in any Regency romance when he is a wealthy, well-bred, gentleman by the name of Darcy. Overall I felt that this story was a little too much of a whirlwind, and rather lacking in the level of detail necessary to make the romance feel sincere. There was little of the formality which was of such great import to the era, and the author told us that the protagonists fell instantly in love without really spending the time on making either appear worthy of the other's affection. It meant that the 'love at first sight' sentiment around which the story centered was not especially convincing. Anachronistic language (such as use of the word "wanker" as a pejorative) as well as uncustomarily-informal behaviour meant that it never really felt embedded into Regency culture. I wish this hadn't been my first experience of a book by Dawn Brower, whose other work appears to be well regarded within the genre. I like the look of many of her other books, and think that this one suffers more from the restricted length than anything else, and would have been better if more time had been devoted to building the sense of peril that would have made Lia's abandonment of Lucas feel more necessary. I'd like to listen to other books by this author before passing judgement on her work, as I do not think that this piece is probably very representative of such an established writer's usual novels. I really wanted to like it but it was rather disappointing. One Wicked Kiss by Dawn Brower is a delightful part of the Bluestockings Defying Rogues. I found this short story to capture my interest with its vivid imagery and alluring characters. 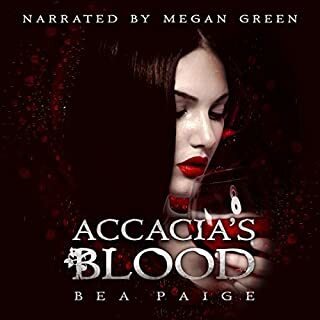 Megan Green brings the characters to life with her narration. She gives distinguishable voices and inflects the right emotions. I will definitely listen to more books by this author and narrator. This is a short book to get you started. Good start with likeable characters. I definitely want to see where this storyline is going. Great chemistry already. Overall nice story, although it was pretty short. The narrator did good on the accents, which was nice. Natalia Benson's father may have been a nobleman, but as his illegitimate daughter, she's treated as no better than a maid. And when he tells her she's to be married to an evil man who frightens her, she flees the only home she's ever known. But a snowstorm derails her escape and she's left not only to the elements, but to the kindness of strangers. 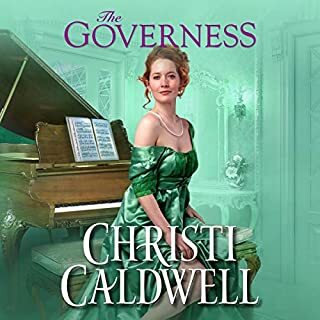 Lucas, the Earl of Darcy, and his friends are looking for a place to seek shelter from the storm when he rescues a young woman from a snowdrift and vows to see her to safety. One of his companions seems to recognize the girl, but the young woman is vague in her responses. Still, he's drawn to her unlike any other and will do anything to keep her from harm. This book is a teaser, a small taste of Luke and Natalia's story. It ends on a cliffhanger that leaves you with many questions. Like who exactly was Natalia's mother? Where are her family? Does her father look for her? Will Lucas accept her and her past? Who knows. Have the next book on deck! Megan Green has the perfect accent for these historical pieces. Her cantor is on point and every character has the own voice without sounding ridiculous. I really recommend any of her pieces and have listened to several that I've enjoyed, such as Rescued by a Sea Nymph. A young lady running from an unkind father who is ready to sell her off finds herself in a terrible predicament. But things may not be as dire as she thinks. She runs into her best chance on the road and does not even realize how much they can help if she will only give them the chance. The narration is nice and easy to listen to. The story is short and leaves you wanting more. One Wicked Kiss by Dawn Brower is a historic romance about a young man who rescues a woman during a snowstorm and falls in love at first sight. 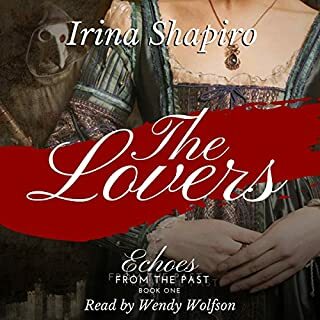 I listened to this book on audio narrated by Megan Green. Megan Green did a great job narrating. I love her accent with the historic romances. This is the first book of Dawn Brower's that I have read and look forward to reading more of her books in the future. 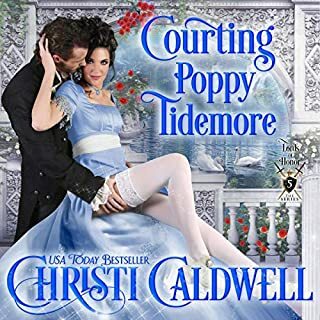 I would recommend this book to anyone that likes historical romances. However, it does on a cliff hanger so be prepared to have the next book in your possession. This book is a great beginning to what I assume will be a great story. The way these two click with each other immediately isn’t something often found so I hope that they will have their own HEA in the future. Megan Green‘s narration was perfect for this story. I look forward to listening to more of her performances. This is the third book in the Bluestockings Defying Rogues Series. This is a short and interesting Historical Novella. I would have loved a completed HEA. 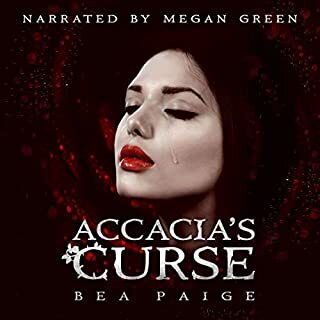 Megan Green did an amazing job with the narration. I received this free review copy audiobook at my request and I have voluntarily written this review. The narrator fit this story perfectly. She had a soft and lovely voice that coincides with the story. It was a good clean romance that fit the time period very well. I would have loved a more resolved ending but I still knew it was going to be a happy one.